Let KidSnips be part of that momentous first haircut. Among the many “firsts” of childhood, getting that first haircut is one for the scrapbook. At KidSnips, we take a child’s first haircut just as seriously as you do. We would be honored to be part of this important event. All of our stylists go through training not only on haircut techniques, but also on how to deal with anxious or special needs children in our bright, fun and welcoming kid-friendly environment. 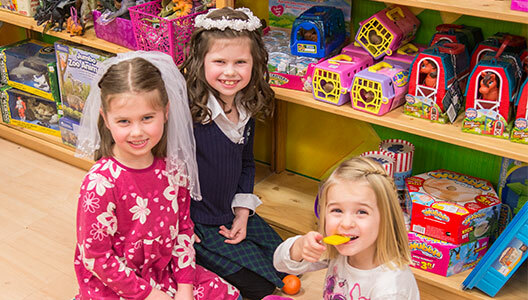 Children and their parents are respected and treated as guests at any one of our store locations. KidSnips’ staff has a lot of great techniques for that memorable first haircut. We’re not above blowing bubbles or playing with toys to make your child feel comfortable! If your child is scared or anxious don’t worry, you have come to the right place. You are in very experienced hands. Our stylists will try to reassure your child and help him or her feel better, and they are accustomed to working with kids who cry or are afraid. To commemorate the occasion, we’ll take a digital photo and present a lock of hair mounted on your own first haircut certificate. Let KidSnips be part of that momentous first haircut. All of our stylists go through training not only on haircut techniques, but also on how to deal with anxious or special needs children. Do you have a child who is nervous about having their hair cut? Learn more about how our salons cater to kids who might be scared. Is this the first haircut for your little one? Click the link below to read some of our suggestions for a great first time experience. KidSnips is proud to support Wigs for Kids. Learn how you can donate your hair to help a child in need. Contact one of our many locations for an appointment today. Visit our affiliates for more resources!